Let’s start this post out by noting this blazer has history! My great aunt gave it to my grandmother back in 1948. Yes it’s 80 years old! I saw my mom wearing it on and off throughout my childhood and once I was in college she mentioned it was my grandmothers. I told her when she was through with it to please pass it along. Sure enough, last weekend I came to visit my parents and there it was hanging on the door knob of my closet in my old room. I was ecstatic! 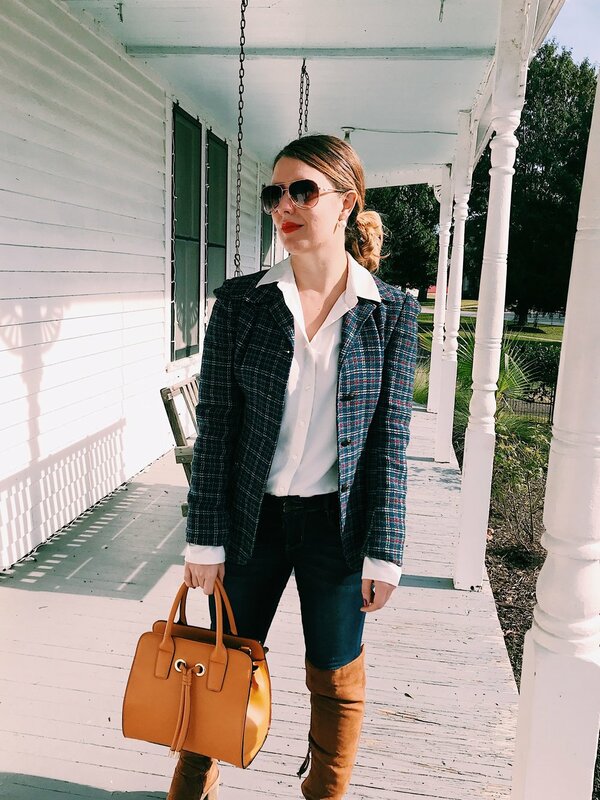 This plaid blazer is the epitome of timeless style so I made it a priority to get this post up and hope you guys enjoy it! A plaid tweed blazer is always an easy choice for dinner, work or on the weekends. You can dress it down with a tee and loafers or dress it up by throwing it over a dress or fluted skirt. 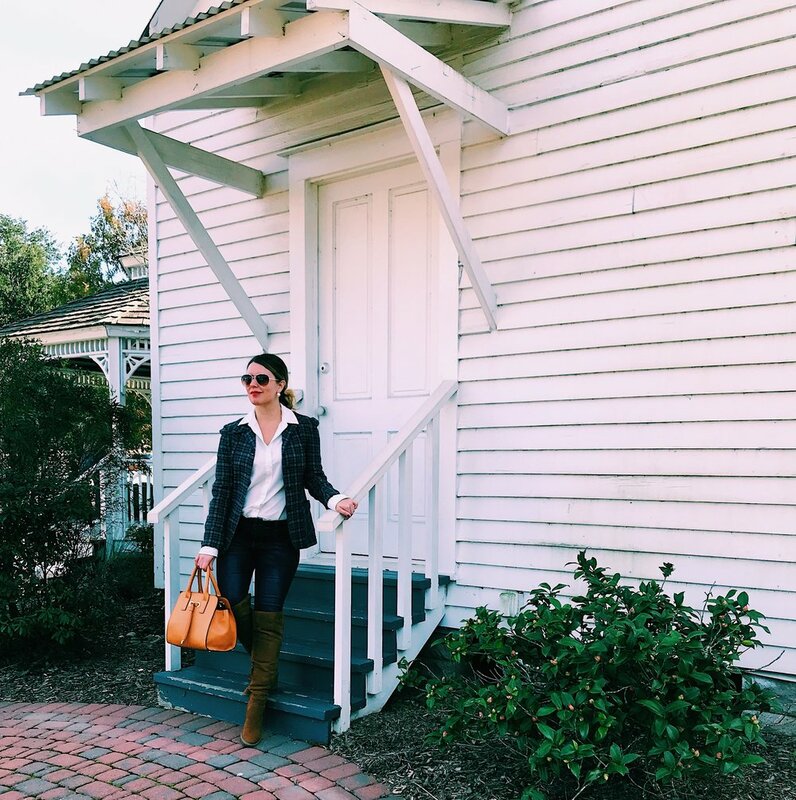 I think my favorite way to wear it is pictured here with a simple classic button up, skinny jeans, structured satchel and over-the-knee boots. It’s a modern yet timeless way to wear it and looks polished for most occasions. Below I’ve rounded up a variety of both tweed blazers and over-the-knee boots. Neither in which you have to spend a fortune! All of the selections below are under $200 and many under $100. When selecting a blazer make sure it fits properly and it’s construction is of good quality. I prefer lining in my blazers to ensure they aren’t going to be itchy if I’m wearing a sleeveless or short sleeved top. Try a few on and try them in different sizes. 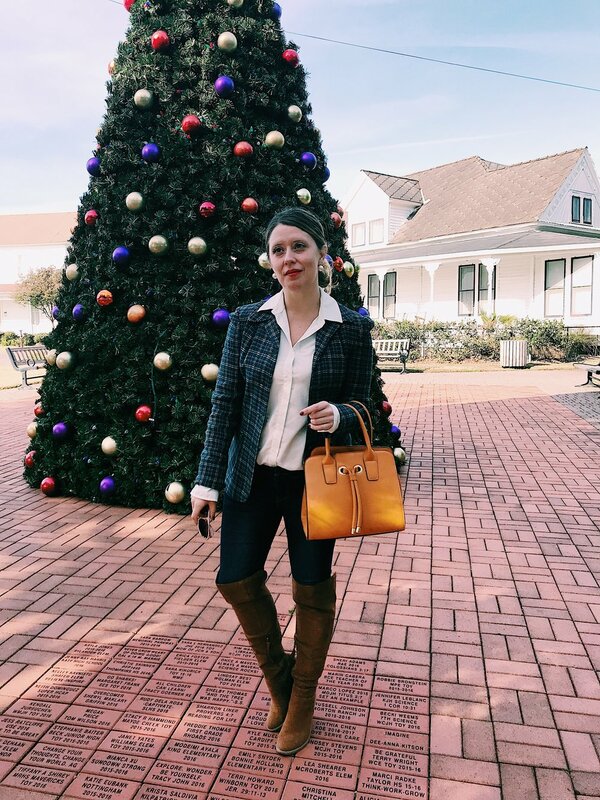 Blazers are typically made to be a fitted unless you are going for the over-sized look so take your time and find something that works for your body type. These photographs were taken in Katy, TX at the Katy Heritage Society property. It’s a little museum near downtown Old Katy where you can learn about some of the figures who made this now Houston suburban area a town. The structures date back to the late 1800’s and it was pretty cool to see how the city emerged. 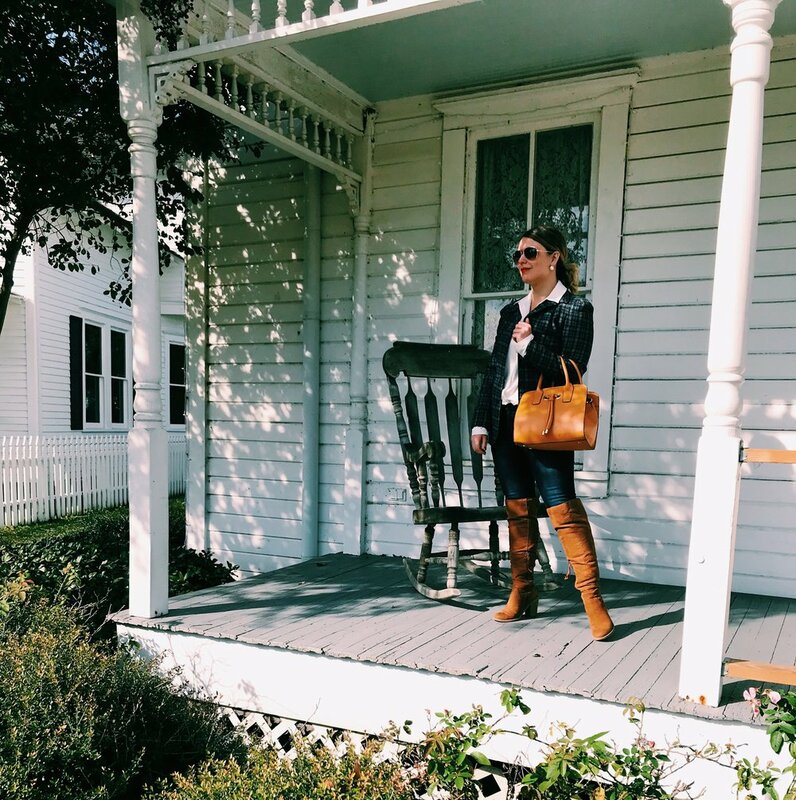 Being a lover of small towns I keep my eyes peeled when traveling to show you guys some of the little road stops you may come across as you adventure. You can read more about many of the small towns and cute places here if you’re interested. Since Thanksgiving is tomorrow I thought it would fun to share an older pot about setting a Thanksgiving table. You’d be surprised by how many items you may already own and just need a little direction on displaying centerpieces, layering linens and finally setting the table. I’m still rounding up a few more looks to post later today for outfit inspiration for the long weekend, but this look would also be perfect for tomorrow!